One of my Facebook friends just posted this neat site that lets you put in your zip code to see a simulation of next Monday's solar eclipse in your area. 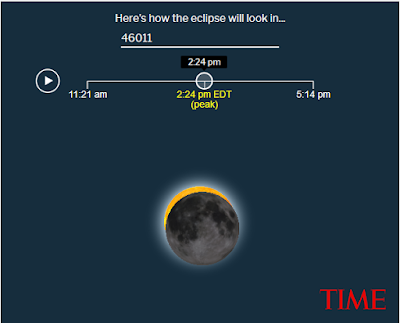 We won't be in the area of complete totality, but it will still be interesting to check it out. Of course, I haven't picked up any of those eclipse glasses or even figured out the best way to 'watch' it. I'm thinking I'll definitely be checking out the shadows on the driveway through the leaves on my tree, but other than that, I don't know. ABC News is planning to do a live special Monday afternoon, and NASA will be streaming it live with views from NASA research aircraft, high-altitude balloons, satellites and specially-modified telescopes. They'll also include live reports from Charleston, as well as from Salem, Oregon; Idaho Falls, Idaho; Beatrice, Nebraska; Jefferson City, Missouri; Carbondale, Illinois; Hopkinsville, Kentucky; and Clarksville, Tennessee. 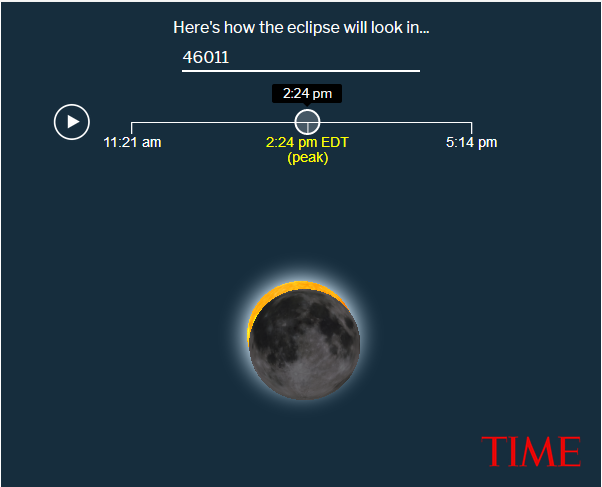 What are your plans for viewing the eclipse?